You may be aware that former Wallabies coach Eddie ‘Beaver’ Jones is now the head coach of Japan. 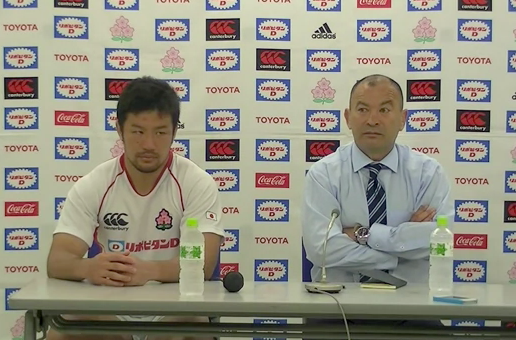 Anyway, back at the end of June, Japan played the French Barbarians and lost 40-21. Here’s the press conference aftermath. It may be the translation, but I’m not sure he was happy with his team’s performance. Make sure you see the bit from 2:30 on. If the Japanese captain ever writes his memoirs, I’ll bet this makes them. And here’s the second half…. Eddie did make changes to the side — 12 in fact. 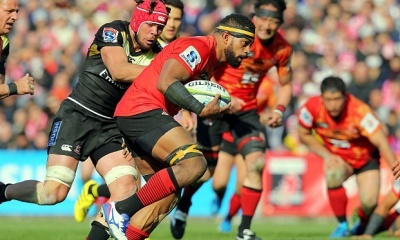 They played a second match against the French Baabaas on the following Sunday, and still went down 51-18. By all accounts he was happier with that effort, though! Ha ha, for a minute there I thought he was telling them to collapse the scrum. Must have worked a treat for him somewhere else. 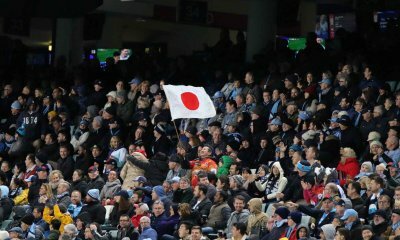 Eddie Jones, flying the flag internationally for Australian srummaging. Seen as their has been some press around lately comparing the success rates of Dingo and Eddie’s, perhaps it maybe a good time to compare their press conferance styles? Poor Eddie. He either understands the Japanese culture really well, or really badly. Methinks the latter. He sounded remarkably similar to when he was coach of the Reds haha.. He was a crap coach then and obviously still is. I can understand this working with the guilt ridden terrified of losing Boks but with the Japanese ? I don’t think so. Can’t see him lasting the year out. Sayonarra Eddie san. Jonny-boy his mother is Japanese, I’d like to think he could understand the culture in a more worse way. Reminds me of my 2 year old when she throws her toys out of the cot, only my 2 year old is smart enough to stop when she runs out of toys. Eddie is a now ordinary coach at best. What happened to the Eddie old old who turned the 10th placed Brumbies in 98 to final winners in 02. He ruined the Reds, did little with the Wallabies. He’s has become worse than Sonny-bill by becoming a gun for hire. I agree with Jonny-boy that he will get bored of losing, like he has done over the last 10 years and quit. He wont take any responsibility and then he will shoot off to the next highest bidder. I think Ewen McKenzie was assistant coach at the Brumbies when they were the beating everyone in 2000 and 2001. He was also the Wallabies forwards coach when they got to the World Cup final in 03. Maybe Eddie really isn’t much of a coach.